Lung, Artery - Embolus, Fat in a male F344/N rat from a chronic study. 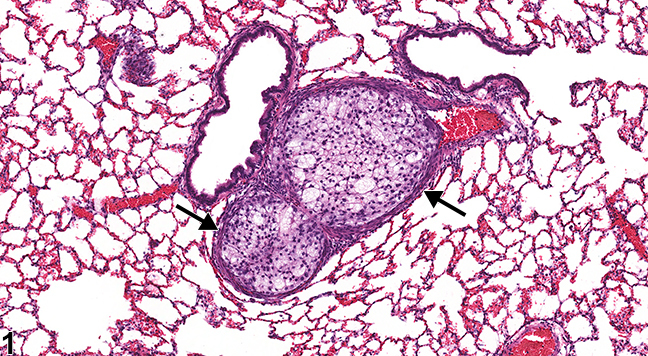 An embolus composed of fat fills the lumen of a medium-sized artery (arrows) in the lung. Lung, Artery - Embolus, Fat in a male F344/N rat from a chronic study. 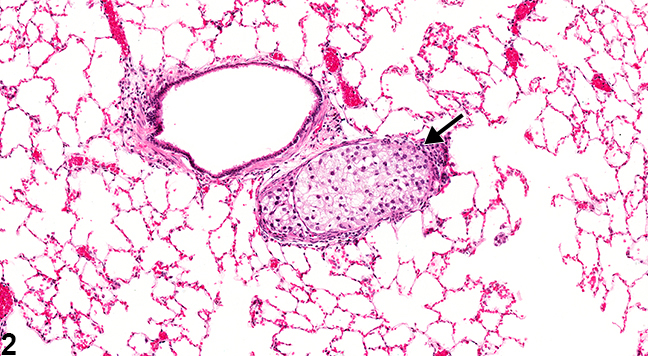 A fat embolus fills the lumen of a medium-sized artery (arrow) adjacent to a bronchiole. 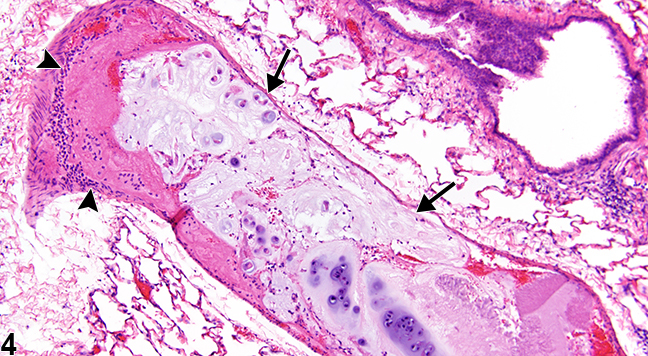 Lung, Artery - Embolus, Cartilage in a male F344/N rat from a chronic study. An embolus composed of cartilage and nervous tissue (arrows) occludes the lumen of a large pulmonary artery. 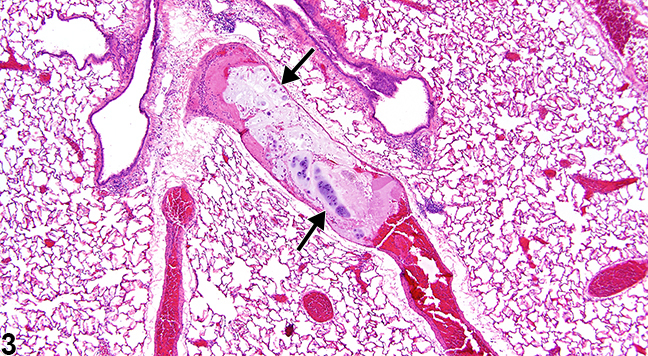 Lung, Vein - Embolus, Cartilage in a male F344/N rat from a chronic study (higher magnification of Figure 3). An embolus composed of cartilage (arrows) and nervous tissue (arrowheads) fills the lumen of a large pulmonary vein. An embolus is defined as a detached collection of intravascular material carried by the blood to a site distant from its point of origin. Emboli may be composed of various materials, including thrombi, bacteria, fat, hair, or air. In natural disease, thrombi detach and give rise to most emboli and are termed "thromboemboli"; however, the opposite situation may occur in toxicologic studies, particularly those involving intravascular administration of compounds: introduction of a test article into circulation may give rise to emboli, ultimately leading to thrombosis. Several examples of this phenomenon exist, including intravascular hair shafts noted in mice receiving intravenous injections. Similarly, intravascular injection of stem cells has been shown to produce pulmonary emboli composed of stem cells, which may lead to thrombosis. Furthermore, emboli composed of fragments of surgical gauze have been reported in pigs following coronary intervention. Emboli often lodge in smaller vessels and cause obstruction of circulation. Secondary suppurative or granulomatous inflammation may develop at sites of obstruction, particularly with emboli composed of bacteria or foreign material (e.g., hair). Emboli should be diagnosed but not graded. The site should be the organ in which the embolus occurs, and the type of blood vessel should be identified using a site modifier (e.g., artery or vein). The type of material comprising the embolus should be identified by using a qualifier in the diagnosis (e.g., cartilage, fat). Lesions in the blood vessel that are secondary to the embolus (e.g., inflammation) should not be diagnosed separately, unless warranted by severity, but may be described in the narrative. Tissue infarcts caused by an embolus should be diagnosed separately as necrosis. Furlani D, Ugurlucan M, Ong L, Bieback K, Pittermann E, Westien I, Wang W, Yerebakan C, Li W, Gaebel R, Li R, Vollmar B, Steinhoff NM. 2009. Is the intravascular administration of mesenchymal stem cells safe? Mesenchymal stem cells and intravital microscopy. Microvasc Res 77:370-376. Kast A, Tsunenari Y. 1983. Hair embolism in lungs of rat and rabbit caused by intravenous injection. Lab Anim 17:203-207. McIff TE,Poisner AM,Herndon B,Lankachandra K,Schutt S,Haileselassie B,Patel S,Quinn T,Adler F,Molteni A. 2010. Fat embolism: Evolution of histopathological changes in the rat lung. J Orthop Res 28(2):191-197. Miao R, Liu J, Wang J. 2010. Overview of mouse pulmonary embolism models. Drug Discov Today Dis Models 7:77-82. Ramot Y, Steiner M, Morad V, Leibovitch S, Amouyal N, Cesta MF, Nyska A. 2010. Pulmonary thrombosis in the mouse following intravenous administration of quantum dot-labeled mesenchymal cells. Nanotoxicology 4:98-105.